I am a pastor, entrusted by God to be the shepherd of ninety thousand souls across the southern part of the state of Nebraska. Tonight, I’d like to speak to you from my experience as a pastor. Many of you are native New Yorkers, or at least native to the East Coast. Before I begin, I should probably explain that Nebraska, where I live, is one of those big square states in the middle of the country which supplies a great deal of your food. If you’ve never visited, you should think about it. It really is a wonderful place. It’s not surprising that I was asked to speak on beauty tonight. It seems that beauty is enjoying a particular moment of interest in Catholic circles right now. In the past few years, Father Robert Barron has written quite compellingly on beauty. In Catholic intellectual circles, there is renewed interest in the theology of aesthetics undertaken by Hans Urs von Balthasar and carried on by various theologians, particularly Pope Benedict XVI. And two years ago, in his apostolic exhortation Evangelii Gaudium, Pope Francis wrote about what he called the via pulchritudinis—the “way of beauty” in the mission of the New Evangelization. Beauty is having a moment, I think, because beauty is particularly “well-suited” to respond to the challenges of our times. Tonight, I’d like to discuss the way in which the via pulchritudinis can respond to our times, serving a critical function in the New Evangelization of contemporary culture. I’d like to offer a few reflections on the challenges of contemporary culture, and then make three suggestions for the role of beauty in the work of the New Evangelization. Last year, I was at a conference in Florida, and I lost my iPhone on a bus. I had it when I sat down, and when I checked for it next, it was gone. Of course, my first thought about losing my phone was that I might have found a good excuse to upgrade to an iPhone 6! It took five days before I could track my phone down, and it was eventually mailed to me by the kindly bus driver who recovered it. I wasn’t on retreat when I lost my phone. I was living my ordinary life—just, suddenly, living it more quietly. My e-mails were piling up, but they weren’t buzzing in my pocket. I wasn’t getting texts or able to send them. If I wondered about something I didn’t know, I wasn’t able to look it up immediately. Instead, I looked upwards, while many of the people around me were looking down at their screens. I had conversations with strangers to pass the time between appointments. When I reached into my pocket, I came upon my rosary before I came upon my device. And when it was time for Morning or Evening Prayer, I opened my breviary instead of opening my app. Now don’t get me wrong. I am not a Luddite. I like my iPhone, and I was glad to get it back. I have two Facebook pages, I tweet, and I use iBreviary. My staff and family and friends are likely to receive texts from me at all hours. I appreciate the potential of our technology. But I also appreciate the consequences of an overly technocratic culture. The Greek word for man is anthropos—which literally means “one who looks up”—an upwardly turning creature. Humans alone can look up to the stars in wonder. And if we aren’t careful, we will surrender something of our humanity when we replace looking up in wonder with looking down at our glowing screens. When we aren’t careful, our technology can make us flat souled—very bored and very lonely. Statistical data has proven this. When we only encounter others through electronic media, we become callous about their humanity. When we watch programs of unspeakable violence in HD, we lose sight of the sacredness of human life. And when we’re hooked to our devices, we are unlikely to marvel at anything in the universe. This “grand reductionism”—it seems to me—is becoming increasingly more apparent. We focus too often on becoming good processors and producers, manipulators of data, rather on than on becoming good human beings—critical minds, and noble hearts—capable of appreciation, engagement, and thought—and hungry for adventure and romance. “Grand reductionism”—and the loss of wonder and beauty—is a particular danger of our time. And the tendency towards reductionism applies even to American religious culture. Once, President Obama said that the United States “is one of the most religious countries in the world—far more religious than most Western developed countries.” Demographers and sociologists would agree. Weekly and monthly church attendance is considerably higher in the United States than in many places. So is belief in divinity, in eternal life, and in universal moral norms. But it is important to understand the substance of prevailing American religious beliefs. Christian Smith is a sociologist at the University of Notre Dame. He’s conducted extensive research on the religious beliefs of young Americans from every major faith group. And he’s concluded that regardless of their religious affiliation, young Americans tend to subscribe to a faith he calls Moralistic Therapeutic Deism. The dogma of Moralistic Therapeutic Deism is this: God exists and desires that people are good, nice, and fair to one another. God can be called upon to assure happiness and to resolve crises. Being good, nice, tolerant, and fair assures eternal salvation in heaven. Moralistic Therapeutic Deism is the “grand reduction” of religious thought and practice to a set of sentimental and affirming principles, absent the presence of a transcendent, personal, and transformative God. It is a religious faith of mediocrity, of insularity, and of loneliness. It requires no greatness of soul. And it engenders no virtue, no charity, and no heroism. Moralistic Therapeutic Deism prevails in our culture. Think, for just a moment, about young people you know. Moralistic Therapeutic Deism probably describes the religious faith of most of them. Christianity is not Moralistic Therapeutic Deism. Christianity is the faith of unmerited greatness—the faith of heroic virtue, unsurpassed hope, and unbounded charity. The Christian life elevates humanity in the great sanctifying process of theosis. By our very baptism, in fact, we are given the capacity to love precisely as God loves. And at the core of the Christian life is a transformative religious relationship with a living person—Jesus Christ. The mission of the New Evangelization is to proclaim the living person of Jesus Christ to those for whom God is a benevolent, impersonal, and mostly impotent figure. We have a tendency to respond to reduction with reduction. Religious minimalism fits well with our iconoclastic, puritan American heritage. And too often, we approach the New Evangelization from a technocratic perspective. We are in danger of reducing even our evangelical and catechetical efforts to the mere transmission of information, to technical processes honed by data analysis to produce a particular outcome. Love is the pathway to transformative and meaningful relationships with Jesus Christ. Knowing and loving Christ begins with seeing glimmers of divinity in the beautiful things of this world. Tonight, I’d like to suggest three ways in which beauty can bring souls into communion with Jesus Christ. 1. The first is the restoration of the beautiful to the world of art, architecture, and culture. Lately, I have been reading the British philosopher Roger Scruton. Scruton is a fascinating thinker, and I suggest you look at his work. It is not without serious problems, but it also possesses very important insights into beauty, love, and the religious sense. Saint Thomas Aquinas says that there are three elements to visual beauty: integrity, proportion, and light. Together, those elements make objects beautiful because they point to the integrity, proportionality, and light of reality—in fact, to the ordered and luminescent nature of God Himself. Beauty points to realities—transcendent and eternal realities—and moves our hearts to know them. We are moved by a painting or a piece of music or a building when it transmits an internal unity in which a consistent whole is balanced and radiant. Even the depiction of sorrow or loss is beautiful when it reveals the profound meaning of suffering. But the “cult of ugliness” in contemporary art is intentionally discordant, unbalanced, and dark. In fact, the metric of contemporary artistic value is too often the ability of a work to shock, to deconstruct, or to destroy. Consider, for example, Marcel Duchamp’s famous Fountain—his submission of a graffiti-ed urinal to a 1917 art exhibition. The work means nothing. It is unbalanced. It offers no insight into existence. It leaves the viewer simply confused and a bit startled. And that seems to be the point. The piece is merely an incarnation of relativistic nihilism. Today, schoolchildren are taught to view such pieces and to remember that “beauty is in the eye of the beholder.” As they get older, they’re given the idea that beauty hardly exists at all. But beauty is not in the eye of the beholder. Beauty is in the essence of the divine Creator and in the thing itself. And art can transform hearts—and transform culture—when it reflects a glimmer of divine beauty. Fostering the vocation of artists is critical to the work of the New Evangelization because art forms souls. Beautiful art forms souls for truth and goodness. Ugliness forms souls for ugliness. 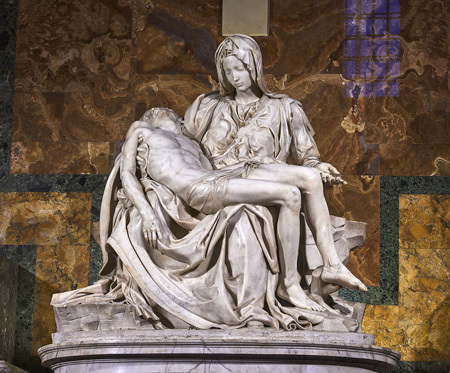 In 1999, Pope Saint John Paul II said that the Church must engage in dialogue with the world of art, because art can be a “bridge to religious experience.” He called for a holy alliance of artists, forming an “epiphany of beauty” in contemporary culture. We’re called to foster the formation of artists whose work transmits the reality of divine love through beauty.We need to ensure that religious institutes and parishes and families foster an appreciation for beauty in art—and foster artists capable of creating “echoes of the mystery.” We need to recognize the spiritual crisis undergirding much of contemporary art and then foster a renewal in creation of the beautiful. The consequence of utilitarian architecture is borne out in souls, which are conditioned to believe even by the spaces in which they live and work that they exist for no more than production and profit. The Church has worked diligently to encourage Catholics to enter the public square proclaiming the faith. But we should also seriously encourage Catholics to consider the public square itself, and the impact of functionalist architecture on spiritual development. If nothing else, we ought to foster the preservation of buildings—churches, schools, homes—which speak to the soul about the transcendent dimension of ordinary life. 2. My second suggestion is the rekindling of the Christian imagination through literature. The Russian playwright Anton Chekhov said that “the business of literature is not to answer questions, but to state them fairly.” I’m not certain that is true. Literature does raise questions, but it can also—in the witness of ideas or characters or stories—point us to the final answers, to the permanent things. Good literature forms a worldview: it offers us insight into our families, our communities, and our selves. Great literature offers us insight into our relationship with God and the world. I had dinner recently with a very good friend of mine—a former roommate, in fact. He converted to the faith shortly before I did. He was from Kansas City, and his father was the foreman of a bag factory. While we were in college, his father lost his job. My friend, Alan, went home for the summer, and saw that his father was struggling with his recent job loss. His father had never attended college or had any liberal arts education. Alan gave his father the dialogues of Plato. During that long summer, his father read them, slowly—often rereading chapters three or four times. Alan told me during that summer, he and his father had the most extraordinary conversations—about truth and hope and justice and love. A new sense of wonder was awakened in my friend’s father. Literature opens our imaginations to wonder. Reading good books exposes the contemplative part of our humanity. Good books can spur in us a sense of justice and charity and generosity. They can expand our souls and inspire our hearts to strive for greatness. We ought to begin forming Catholic book clubs and literary circles, comprised of ordinary, everyday Catholics, reading and reflecting on important ideas and beautiful stories. Literature forms imaginations and plants seeds of inquiry. And sharing ideas in dialogue allows them to germinate—to move hearts and minds to fruitful relationships with Christ and His Church. 3. My final point is about recovering a sense of wonder in the liturgy. Common worship—liturgy—is a place for formation in Christian wonder. We’ll conclude tonight with Compline—and the experience of common prayer, celebrated beautifully, is likely to stay with you far longer than anything I’ve said tonight. The absorption of holy words and gestures is a component of the redemptive process. 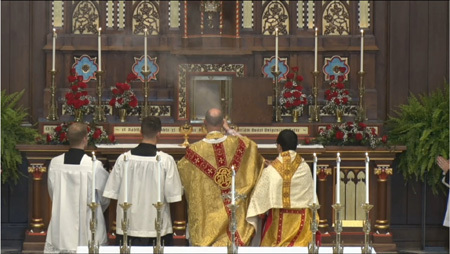 Without our even knowing it, holy liturgy effects change in our hearts. Because good and holy liturgy opens our hearts, lifts up our hearts—sursum corda—as the Preface to the Roman Canon reads, to an experience of transcendent and ineffable mysteries. We are more than the sum of our intellects. And the Incarnation, the liturgy, and the Lord Himself are mysteries. These mysteries are sometimes only encountered in modes that reach our senses—that draw us to a contemplation that is deeper and richer than cognition or mental prayer. God is mystery, and the liturgy is, among other things, an encounter with that mystery. Wonder is the only response. This is why we speak of beauty as something “transcendent.” Every instance of real beauty points beyond itself, toward the infinite perfection of God. He invested this world with many forms of captivating beauty so that created things would lead us to contemplate the transcendent glory of the Creator. We can think of beauty as a kind of language, through which God speaks to our hearts and souls. He is always speaking in this way—to all of us, believers and nonbelievers alike. Fostering beauty in the liturgy fosters souls who encounter divine mysteries with an attitude of wonder. G.K. Chesterton once said that in every age, God gives us the saints that we need. That’s true. In every age, God also gives a pathway by which to bring the world to Jesus Christ. Today, Pope Francis says that the pathway to Christ is the via pulchritudinis. Beauty responds to the flat-souled, reductive culture in which we live. Pope Benedict wrote often that beauty is an arrow that wounds—by that, he meant that it penetrates hearts which reason or virtue might never touch. If we are serious about transforming culture for Jesus Christ, beauty has a role to play. Of course, after this lecture, we might all look at our phones for a moment, and when we go home, we might turn on the television. But we need to create space for beauty. We need to foster its cultivation. Beauty will move us to contemplation, and contemplation to Jesus Christ. Beauty will move us to the incarnate Love of God. Dostoevsky wrote that “beauty will save the world.” It might. But only if we foster beauty, and then invite others to the experience, in order that they might experience the harrowing and transcendent beauty of the Most Blessed Trinity. This talk was given March 14, 2015, in New York City as part of “The Art of the Beautiful” lecture series sponsored by the Thomistic Institute and the Catholic Artists Society. The Most Reverend James D. Conley was ordained a priest for the Diocese of Wichita in 1985. 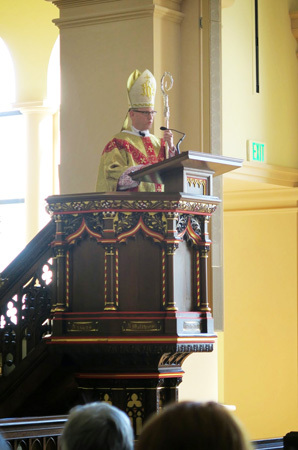 He was ordained in 2008 to the episcopacy and served as auxiliary bishop of Denver until his appointment as bishop of the Diocese of Lincoln by Pope Benedict XVI in 2012.